On the black market, the right to lease one hectare of woodland sells for up to € 30,000. The sellers are racketeers who, between 2008 and 2012, succeeded in signing leases with Moldsilva. RISE Moldova went undercover to investigate the forest traffickers and how they got millions of lei from transactions involving state property. One Moldsilva employee, through an intermediary, offered to “sell” RISE 4 hectares of woodland for € 75,000. Moldsilva is the government agency responsible for managing Moldova’s dwindling supply of valuable forest stock, which experts say is under increasing threat from development. In August 2012, Moldsilva announced it would suspend the leasing of woodlands for an undetermined period. This happened after a Parliamentary commission found serious violations of the country’s Forest Code. Some existing contracts were terminated, mostly for non-payment of lease fees. Nonetheless, more than 6,700 hectares of woodlands remain controlled by lessees for between 20 to 40 years in exchange for annual fees of 4,025 lei (US$ 204) per hectare. A lease allows its holder to use the property for recreation, such as hunting or fishing, or to erect a non-permanent structure. A building with a cement basement, for example, would be illegal, while a wooden shack would be OK. Building permanent structures requires changing a woodlot’s classification to “non-forest”; to log it requires permission from Moldsilva. According to the World Bank, Moldova has “one of the smallest forestry sectors in the Central and Eastern European region” (less than 15 percent in 2010, compared to the European average of about 46 percent) and should be working to increase the amount of forested land. But the attempt by the authorities to rein in chaos in the forests has led to the creation of a new business: the sale of leasehold rights. The racketeer does not want money for the company sale as it is just a wall behind which the real transaction takes place: transferring control of the forest land, for which the trafficker asks tens of thousands of euros, usually in cash. For bank transfers, the trafficker proposes concluding fake agreements to justify the transaction. 3 June 2015. At a terrace in the center of Chișinău, RISE reporters posing as potential buyers meet a man who is offering to “sell” 4 hectares of woodland. He brings to the meeting the entire set of documents proving he controls a leased woodland plot across from the Moldovan president’s residence in Condrița, a small community west of Chișinău. The seller’s name is Anatolie Babără, and he is a retired police officer with farming businesses. He had published an advertisement: “4 hectares of land for sale. Flat land with connection to international road, convenient location. For a recreation area.” He agreed to meet without hesitation. Babără seems like a born salesman, his sunglasses pushed up on his head and his summer shirt unbuttoned to display the gold chain around his neck. The former police officer assures the buyers “his forest” is the best in the area. Anatolie Babără: “You have enough small glades there where it is not necessary to cut down anything and you can do whatever you want. The flattest land, with no (ravines), is mine.” And, he says, it’s right off the European-standard Chișinău-Leușeni road. Babără says he leased the 4-hectare plot for 30 years in the summer of 2009. Five years later, he assigned the leasehold right to BP Green SRL, a company he founded. He wants € 20,000 (US$ 22,800) to assign his leasehold right. After negotiations, he says he will go down to € 16,000 if a bargain is struck that very day. He says he wants to invest the money into a farming business that he had started in northern Moldova, and will accept payment in cash or by bank transfer. In case of a transfer, he recommends signing a fake agreement with one of his companies. Several hours later, on the same terrace, RISE negotiates another deal. This time the seller is businessman Nicolae Bulat, who laconically describes his offering on an advertising website: “Ltd., 10 hectares of woodland for recreation in the region of Dumbrava.” He is just as terse in person. Suspicious and slightly nervous, at first he avoids giving too many details. He wants € 100,000 for the 10 hectares. “I’m selling the company that owns the forest. Everyone does so. What do you want to negotiate? Believe me, it’s not so much. I know the prices on the market,” he says. The buyers work hard to get a 10 percent discount. “Ninety thousand, I can go down only that much. No discount if you pay in installments. Like at the bank. The object is important, (it’s a) 5 minute drive away from Chișinău,” Bulat negotiates. The parties get into a Mercedes Sedan with leather seats and head for the Durlești forest. The plot under discussion is located near Chișinău, on the Balcani Road. He stops the car on a recently asphalted road in the forest that leads to an imposing construction, recently erected. “You can do anything if you have money. They’ve raised this construction right on the hilltop. Concrete foundation. It’s connected to water and sewerage pipes. You have anything you want here. The sewerage crosses my forest,” Bulat claims. The group gets out of the car and walks into the forest on an adjacent road, going about 200 meters into the middle of a glade. “It’s 10 hectares. Can you imagine how much this is?” Bulat says. The buyers say they prefer a smaller plot, and Bulat makes another offer. “I have another 4 hectares elsewhere, via a different company. If you are interested…,” he says. Back in the car, the trio heads towards the village of Hrușova, located about 10 kilometers from Chișinău. The sites rises up a hill at the village outskirts, right next to the Sky Land Pension, located on another leased woodland plot. Bulat owns both plots through two companies. Tirvesttrans SRL manages three woodland plots with a total area of more than 4 hectares near Hrușova, while the 10 hectares in Durlești are leased by Megavox SRL. He says his brother, Anatolie Bulat, also manages 2 hectares of woodland near the village of Colonița. He signed a lease agreement with Moldsilva in 2008, on the New Year’s Day, for a 30-year term. Several weeks later, an ad for the 10 hectares in Durlești appeared on the website of a real estate agency. This time, the price was down to € 85,000, with the possibility of a barter or even credit-based purchase. 9 September 2015. RISE reporters wait for another seller next to an office building on Veronica Micle Street in Chișinău. He appears at the wheel of a silver Toyota, remotely opens an iron gate, and beckons the reporters in. The reporters spoke to him over the phone about 3 hectares of woodland for sale. Inside an older, casually dressed man invites them into his office. With a strong Russian accent, he recounts how he wanted to build a pension there: “I thought my children would bring me grandchildren,” he said, smiling at his son. “I wanted to get out of the city. To go there and each of us to have a little house.” Now he is willing to cede his leasehold right on the forest for € 60,000, a price that he says includes the company procurement costs and the notary’s fees. The day after meeting Tatarciuc, the reporters went with his son, Alexandru Jr., to see the site, southwest of Chișinău in Ialoveni. Past an experimental plot of the Agrarian University of Moldova, the car climbs a hill, alongside the forest boundary. Through the trees, a number of buildings can be seen, surrounded by iron fences with tall gates. Dogs growl from behind them. Oaks mainly grow on Tatarciuc’s plot. Overgrown with shrubs and weeds, the plot has numerous broad little glades with holes full of ashes and randomly thrown wastes. Here and there are tires and strange humps. Alexandru Jr. says it was in this condition when they leased it from from Moldsilva. After the ‘inspection,’ the reporters call Andrei Țînțari, a businessman who was among the first to build a house in this forest. Tatarciuc recommended Țînțari as a consultant on how to build in the forest. “Țînțari is among the first neighbors who made a construction in the forest. He built a house and a sauna. It is not built as a temporary construction, but decently,” Tatarciuc said. Initially, Țînțari avoids a meeting but finally agrees to meet the following day, Sept. 11 at his company, Algu Construct SRL which specializes in building wooden houses. It is located in Fashion House of Chișinău; he is late, arriving at a terrace one hour later. Țînțari arrives in a field car. He sits down and lights a cigarette, displaying workman’s hands, accessorized with two rings, a watch and a bracelet. The reporters tell him they’re interested in Tatarciuc’s plot and want to build a number of buildings there. Țînțari starts listing the drawbacks of the land and proposes instead a two-hectare plot that his neighbor is selling. That same day the reporters call Șeremet, director of the design company Arhgrup SV. Told he was recommended by Țînțari, he agrees to meet the next day, Sept. 12. Arhgrup SV is located in a student dormitory of the Technical University of Moldova (TUA) on Studenților Street. Up the dark stairs of the dormitory is a door protected by a video camera. Șeremet cautiously locks the door behind his guests. “Ninety percent of the forest constructions were designed by me,” Șeremet boasts, showing on his computer and smartphone a number of wooden villas and restaurants that he had designed for forest lessees. Learning that the buyers aren’t yet sure which lot they want to buy, Șeremet offers to help. At one point, he even offers to sell the journalists 2 hectares of woodland he leases in Durlești, near the forester’s house, for € 30,000 per hectare. The reporters meet Șeremet again the next day. He has four offers from “Igor”, the Moldsilva engineer. One is a plot in a birch forest on the Chișinău-Leușeni Road, near the village of Nimoreni. Șeremet tells us that Igor is in charge of selling this plot. “There are people who go to Moldsilva and say that they give up the respective plot. They keep it and, if someone comes up, they sell it,” Șeremet says, explaining how some Moldsilva staffers intermediate forest transactions. Reporters get Igor’s number from Șeremet, and match it to an agreement for the lease of a woodland plot signed by Igor Mocanu, presented on Moldsilva’s website as forest lease engineer. They contact Mocanu on Sept. 18. RISE: Good afternoon Mr. Igor? RISE: I have your number from Mr. Șeremet. I’m calling you in connection with the hectares from Nimoreni. Can we meet to discuss the details? I.M. : We are now leaving the city but I’ll call you when I’m back and we can make an arrangement. I don’t know exactly when I’m back. It will be 5 or 6. If it doesn’t work out today, I’ll call you tomorrow. 26 October 2015. RISE reporters go to Moldsilva for an interview, as journalists. Mocanu says that he knows Șeremet but denies having helped him identify the four woodland offers. Mocanu: I know Șeremet. He is an ordinary lessee. He didn’t ask and I didn’t identify anything. Whoever Mr. Șeremet called, it’s his business (…) If you believe me, two or three people may call me every day and ask me different things about the lease. I can’t remember everyone, who asked me what. Mocanu: I know you called me earlier. How could I ask money for the hectares if the hectares are not mine! What did you ask me? I understood it was about something completely different. A land plot, near Nimoreni, 6 ares [600 square meters], with one house. This is what I understood. I haven’t spoken with anyone about four hectares. In general, I wouldn’t speak on the phone about something like this. A few minutes later, in Mocanu’s office, Șeremet admits having called Mocanu to get information about lessees who wanted to terminate their contract. Later, Șeremet denied getting the four offers from Mocanu and said he had provided Mocanu’s number by mistake. Șeremet: “We are not talking now about this Igor. If I open my phone contacts – “Igor forest” there are many of them. If I gave you his number, then it was a mechanical mistake. I’m sorry.” He, however, refused to show reporters his telephone contact list. The plot in Nimoreni was leased in 2008 by Ecoradix Grup SRL for 30 years. The contract was signed by Valentin Butnaru, the company’s manager and only founder (Details, HERE). One year later, he filed a request with Moldsilva to assigned the lease from his company to his individual name, arguing “the company was facing a financial-economic crisis.” The agency agreed and, in September 2009, the delivery-receipt act for the forest lease is signed. Five years later, on 20 May 2014, Butnaru founds a new company, Eșantion SRL (Details, HERE). Ten days after that, he signs a new agreement with Moldsilva and assigns his leasehold from his individual name to the company. In one month, the new owners of Eșantion SRL are brothers Boris and Ion Stratan. Mocanu: I know those from Eșantion. I know everyone. I don’t have a special relation with Stratan. RISE contacted Butnaru, expressing interest in buying the birch forest. “I got rid of (the forest) two years ago. I ceded the company, gave it to another person, without any price without anything, I simply gave it away,” he said. Mocanu and Șeremet are neighbors in the Durlești forest. Mocanu has been leasing a plot of 15 ares since 2011, while Șeremet, since 2009, has managed the 2 hectares he offered for € 60,000. In the same zone, on an area of nearly 300 hectares, more than 70 people, including civil servants and businesspeople, own woodland. However, in the land registration office, all the plots appear under the same registration number. The plots are located right near the forester’s house and the Durlești Forest Range. 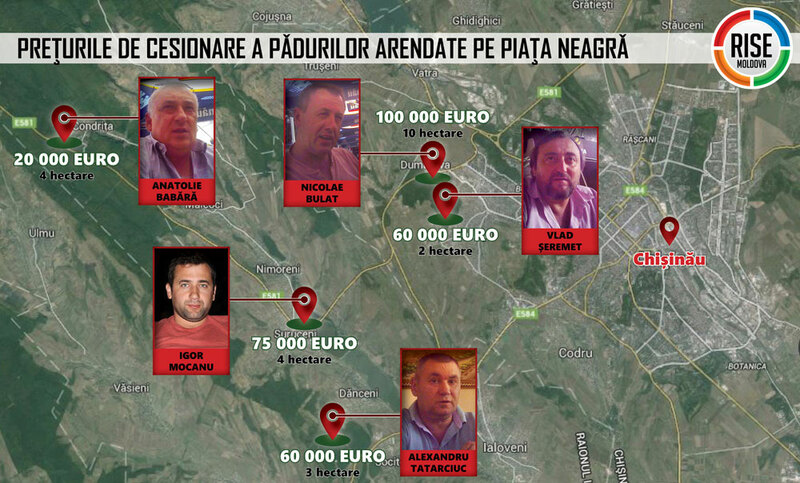 Radu Grosu, Moldsilva’s lawyer, also holds a plot of 15 ares (1,500 square meters). All lease agreements were concluded on the same day – Nov. 22, 2011. Asked if he was leasing woodland from the institution he works for, Grosu initially denied it. Later, though, he admitted managing the 15 ares but said the plot was leased by a company. According to land registration documents, the land is in his name. Ion Platon: With the approval of the amendments to Decision 187 all of these things will disappear… It would be good for such situations to not appear, to make a contract clause by which to forbid any assignment. We observe all the rules set by Decision 187, to the extent possible. The businessman is a former police officer with his domicile registered at 12 Calea Ieșilor Street, where the Buiucani Police Station is located. Nicolae BULAT, businessman. [Forest trafficker] – is partner in the companies Megavox SRL and Tirvesttrans SRL, both beneficiaries of 14 ha of woodland leased in from Moldsilva. He is the only partner of the company Concord-Maxima SRL. In 2014, the company obtained from the Energy Regulator a license for “supplying electric power at non-regulated tariffs” for a period of 25 years. Ivan BULAT, another brother of Nicolae Bulat, is manager at Trans Ager Com SRL. In 2010, the Acting President Mihai Ghimpu awarded him the “Civic Merit” medal.